Published by Ivan M. Granger at 7:57 am under Books,Poetry,Poetry Chaikhana Misc. I know, I haven’t sent a poem out for the last couple of weeks. The reason is that I have been deep into the final edits on the printed proof of the new Poetry Chaikhana anthology. I’m so pleased with how it is coming together. I hope you will be too. Like the previous Poetry Chaikhana anthology, This Dance of Bliss will feature historical sacred poets along with a few contemporary voices. Rumi, St. John of the Cross, Lalla, Goethe, Hildegard von Bingen, Dogen, Khayyam, and many other favorites. Each poem is accompanied by the same sort of short meditations, musings, and commentaries you know so well from these emails. I will share more of a sampling from the book soon. Several of you have already asked about pre-ordering copies of the book and, yes, I will be making this new anthology available for pre-orders very soon. Pre-ordered copies will come with a discount and a few other extras. Stay tuned! As I bring this new anthology to publication, I may not be able maintain my normal weekly pattern with these poem emails. I am also trying to keep my work hours up at my day job, which is not always an easy balance, so sometimes these poem emails have had to wait. 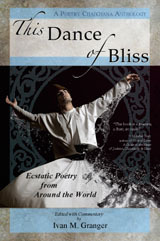 But the new book is very nearly ready — and then we call all join in on this dance of bliss!